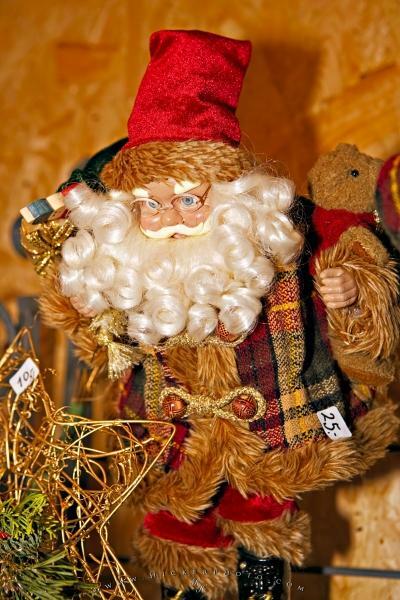 An array of beautiful ornaments and gifts are available for purchase at the annual Christmas Market at the Hexenagger Castle in Germany including many depictions of Santa Claus. A Christmas ornament of a Santa Claus features a satiny beard, tiny glasses and is adorned with a red hat and a type of tartan fabric coat. This santa ornament was found at the Christmas markets held annually at the Hexenagger Castle in Bavaria, Germany. Santa ornament at the Christmas Markets at the Hexenagger Castle, Hexenagger, Bavaria, Germany, Europe. Photo of a Santa ornament on display at the Hexenagger Christmas Markets in Germany.